The name “El Morya” may be unfamiliar to some. But it is more than likely that millions have heard about one or more of his past lives. Because of his tenacious love of the will of God lifetime after lifetime, El Morya has come to embody the quality of obedience to holy will. Today he serves from heavenly realms as the Chohan1 of The First Ray2, the blue ray of God’s will, faith, protection and power. Abraham. His story is told in the first book of the Old Testament. Both Jewish and Christian children alike have heard the tale of God’s call to his obedient son. “Get thee out of thy country…and from thy father’s house unto a land that I will show thee.”3 God promised Abraham that his obedience would lead to blessing. He would be the progenitor of a great nation. Abraham left the house of his father. And God did bless him. Called the Father of Nations, Abraham, even in his advanced age, was sired a son, Isaac. From this lineage the Twelve Tribes of Israel emerged. 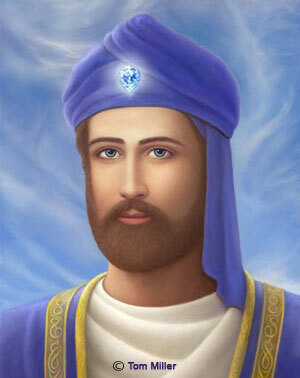 El Morya was Abraham. In the fifth century, a ruler of mythical proportion enters life’s stage. Arthur was the creator of the Table Round, a culture of brotherhood whose rallying cry was, “All for one and one for all!” His holy knights were reputed for their bravery in battle and service to their monarch and his kingdom. No myth, this noble soul forged a glorious society where respect, justice, courage and truth prevailed—the mystical Camelot. El Morya was King Arthur. Twelfth century England finds the soul of El Morya incarnated as Thomas Becket, Archbishop of Canterbury, defender of the church and at odds with King Henry II. Conflict regarding the influence of the church in the political affairs of the realm rise to a fever pitch. And Becket pays for his stand with his very life, brutally slain within the environs of his own cathedral by four knights performing the king’s bidding. In the nineteenth century, El Morya, while residing in the spirit plane, collaborated with two other unascended masters4—Djwal Kul5 and Kuthumi6—to work through Madame Helena Blavatsky7 and others in order to teach occult mysteries to a larger body of mankind. The founding of The Theosophical Society8 by Blavatsky in 1875 would be a major vehicle for this purpose. Lifetime after lifetime, love for the will of God was the driving force of El Morya’s soul, even to the laying down of his physical life as Becket and More. The striving of this “Man for All Seasons” won him his ascension9 in 1898. Today, El Morya is the chief of the Darjeeling Council, a heavenly governing body who serves in an etheric retreat over Darjeeling, India. He works with many other ascended masters—Chananda, Kuthumi, Saint Germain, Jesus, Mother Mary, to name some—for the upliftment of mankind and an instilling within their hearts of a similar love for the will of God.